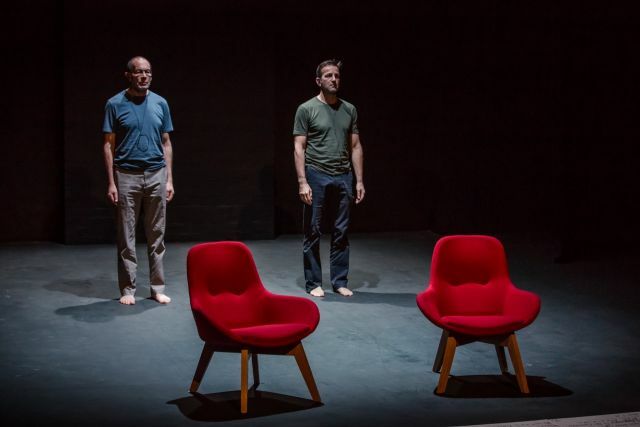 Devised and performed by Australians Brian Lipson and Gideon Obarzanek and directed and choreographed by awarded Adelaide choreographer, Lucy Guerin, Two Jews Walk into a Theatre … challenges the very nature of theatre and of our strongly held beliefs and preconceptions. Many of us reach the stage in life where, with some horror, we start to sound, and look like our mother or father. Obarzanek and Lipson have taken this one step further. For this performance, they become their fathers, discussing their children and their own fathers; the men who shaped their lives, for better or worse. 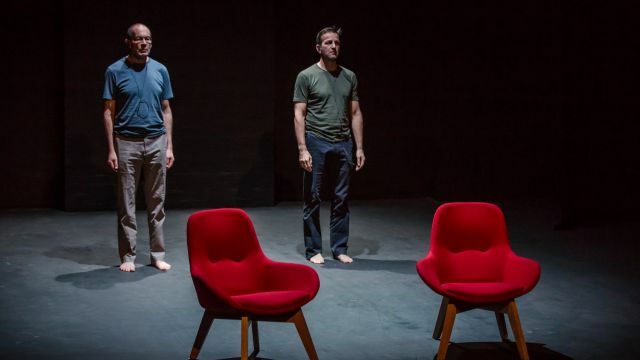 We meet the two performers perched on high seats, with backs, (they point out the importance of this) at the front of the stage, but, through their eyes, they are in the foyer, waiting for a performance by their very flawed, self-centered sons to begin. Much is made of Adelaide’s time difference zone, our wonderful public transport and the location of the theatre. The banter is that of two older men who are used to being opinionated, unchallenged. Much is made derisively by Lipson of their sons being involved in experimental theatre. Described as a ‘dramatic experiment’, the clever irony is that this is exactly what this performance is. Taped to the floor are large sheets of butcher’s paper covered in no more than one line, or one word cues. The show is improvised, changing, developing as each performer portrays their father with the intimacy that only family can provide. Lipson and Obarzanek build in a range of issues and heated responses to their different views and experiences with being Jewish, the state of Israel and the world’s current crisis with managing refugees. We are reminded that all Jews have at times been refugees. Obarzanek’s family fled Poland and Lipson’s escaped the pogroms in Lithuania. Both have names that are not what they used to be, as do many Jews fleeing to safety. Each identifies differently with Jewry. This is not just a show for Jews. It has all of the favorite stereotypical Jewish topics: illness, death, families and the unrepresentative beliefs about Jewish frugality, but importantly, it explores what it is to be a father, to be a son and to have a proud heritage that shapes you. The end is a surprise. The two performers ‘become’ the sons and we see a tightly choreographed performance that is done to Oren Ambarchi’s haunting music. The experimental theatre becomes an experimental theatre production. This is a witty and cleverly contrived show and it turns the concept of performance on itself. The humour is gentle and relatable. The actors’ skill is notable. Planned silence is used to great effect, building tension and mood and capturing audience interest and attention. Anyone who has or had a son or father will see themselves in the mirror that this show cleverly holds up to us all. The performance feels just like a natural chat where two old Jews walk into a theatre.